Need a Measuring Tape? We've Got One For You! Being the DIY geek that I am, I always assumed that just like me, everyone had a soft measuring tape in their inventory. I was wrong. A soft measuring tape is a crucial tool when it comes to figuring our which size corset will fit you best. How else is one expected to note their waist measure in inches? Sure, you can certainly take a piece of ribbon or string or even a shoe lace, wrap it around your waist, mark off the points that touch and measure that against a ruler or stiff measuring tape...but that can be a bit of a tedious process. Plus, I have to assume that if you haven't got a soft measuring tape, then you are probably even less likely to have a ruler or yard stick just laying around. But fear not! Not having a soft measuring tape is no longer an issue! We have come across what I think to be one of the most brilliant tools available to everybody with an internet connection. Voila the printable measuring tape! Simply visit the link below, print, cut, tape and bam! 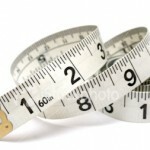 Soft measuring tapes for all!